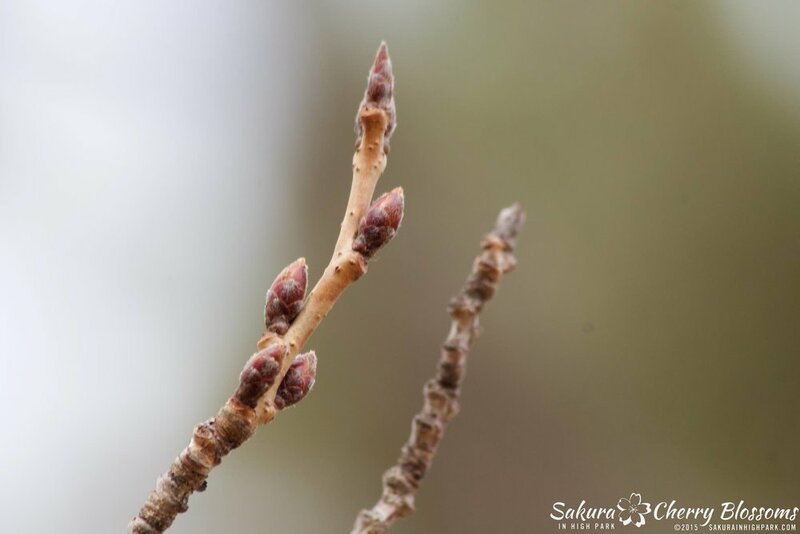 Sakura Watch, April 2, 2015 - Easter weekend Sakura buds show continued signs of healthy growth and size though we are still a month away from seeing the cherry blossoms. A few days of warmer weather and a little rain in High Park has finally melted away all the snow. Left behind is only a thin layer of ice skimming Grenadier Pond. There is still time for the trees to develop and the buds are currently still small to medium sized on most trees in the park. One other positive sign noticed is a good number of new branch off-shoots with robust, copper coloured buds seen growing on many of the Sakura trees this year - this is an excellent indicator at how well the trees survived this winter and that the potential for seeing larger blooms this year is a strong possibility. As we head into the long weekend, I wish everyone a very Happy Easter and enjoy the chocolate and treats! As April hops along, you can look forward to more progress reports on the Sakura // Cherry Blossoms in the weeks ahead.